Deborah Feairheller, left, has a Ph.D.in exercise physiology and sports science and teaches at Ursinus College. The Penn State grad and mother of three also is a volunteer firefighter. She performs a test on Dane Edwards, 23, a firefighter in full uniform, walking on a treadmill. Battling the flames and billowing black smoke, Deborah Feairheller fought her way into the Caln Township home. As a metal air pack pumped oxygen into her mask, she yanked down the ceiling with a long pole to ventilate the attic above. Understandably, she feared for her safety, if not her life.
" 'Is the floor going to hold me up?' " Feairheller said she thinks each time she enters a fire. " 'Is the ceiling going to fall on top of me?' "
Yet Feairheller knew, better than most, that the top cause of fatalities among firefighters is not collapsing walls, or ceilings, or floors - or smoke inhalation. Nearly half of all firefighting deaths result from heart attacks. In her day job, the 43-year-old mother of three is an assistant professor and researcher at Ursinus College, where she has been gathering data on firefighting deaths. According to the U.S. Fire Administration, Pennsylvania logged 36 fatalities in 2012, the most in the nation. For Feairheller, the research is personal, and not just because she fights fires. "My family has a history of heart disease and heart attacks," Feairheller said, sitting on an exam table in Ursinus' HEART (Hypertension and Endothelial Function With Aerobic and Resistance Training) lab. Feairheller is studying the effects of heavy gear on the heart. The Ursinus-funded study will continue for at least a year, and Feairheller said she plans to do spin-offs that will account for environmental factors, including body temperature. 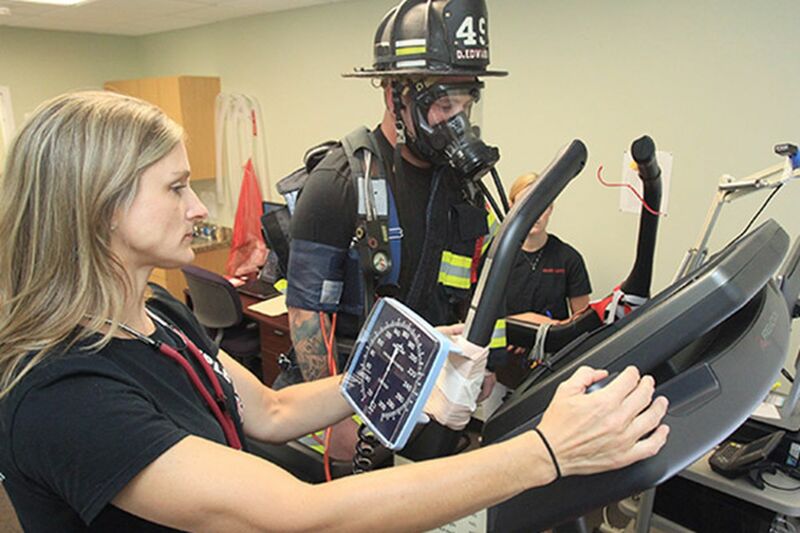 This study, her first on firefighters, is in its early stages, but Feairheller said she has, not surprisingly, seen blood pressure increases when people work out in gear. Stefanos Kales, an associate professor at Harvard Medical School, has researched firefighter health for more than 20 years. "Most disturbing is, in the last couple decades, about 25 to 30 percent of people who die on the fire ground already knew they had heart disease," Kales said. "Physicians and the fire service have been reluctant to remove that person from the service." Feairheller's study focuses on volunteers, who constitute most of the nation's firefighting force. The average age of volunteer firefighters is 50, said Heather Schafer, executive director of the National Volunteer Fire Council. And Kales said volunteer departments tend to have fewer resources for health programs. Dane Edwards, 23, an East Brandywine firefighter, completed his second stress test with Feairheller on Wednesday in 52-pound gear. As he walked on the inclined treadmill, his blood pressure and heart rate were recorded at varying speeds. Feairheller asked Edwards to rate how he was feeling throughout. She will compare this data with that from his first test, not done in gear. Standing beside the treadmill, Feairheller, lean and muscular, with blond hair cascading onto her black East Brandywine Fire Company T-shirt, does not look the part of a tired professor. But she said she had logged many sleepless nights. And not just the restlessness that accompanies raising three children. "If I'm home" and that pager sounds, Feairheller said, "I'm there." Her firefighting colleagues call her Doc. She has a doctorate in physiology from Temple University, and she also volunteers with the Collegeville Fire Company in Montgomery County, next to Ursinus. "The guys . . . they're all fantastic," said Feairheller, who said she has always fit in with the boys. Perhaps, Feairheller said, that's a result of her martial arts background as a second-degree black belt. John Edwards, East Brandywine's fire chief and Dane Edwards' uncle, met Feairheller when she came into the station to ask about a fire extinguisher. "She put out her neighbor's grill fire," John Edwards said. "We joked with her, 'You're doing our job.' "
Feairheller asked how she could sign up, John Edwards said. Someone asked her if she wanted to do desk work, Feairheller recalled. Absolutely not, she said. Feairheller wanted to be in the action. Now, Feairheller is a top responder, also juggling motherhood, two classes a semester, advising at the college, and research. "I like to go to bed and when my head hits the pillow," Feairheller said. "I'm out." Unlike many in the service, firefighting is not in her blood. She grew up in outside Pittsburgh, in the town of Indiana. Feairheller attended Pennsylvania State University, where she studied microbiology, and met her husband, Philip, a software architect. She worked in pharmaceuticals, but, after having children - two girls, now 18 and 19, and a boy, 16 - she became a personal trainer. After studying and doing research in California, last year she joined the health and exercise physiology department at Ursinus. Always active, Feairheller has little time to relax. If she had a day off? "I probably would sleep," Feairheller said with a laugh. "And drink some wine. Spend time with my family." On vacations on North Carolina's Outer Banks, "my husband and I always say we will take a break," Feairheller said, "but neither of us can sit still." The couple also enjoy returning for Penn State football games, camping out in an RV homecoming weekend with her college roommate. Mostly, though, she works. "She has a strong work ethic," said Brian Freas, a fellow Collegeville firefighter and study participant. "And believes very strongly in the research she is doing." Feairheller wants to increase heart-health awareness among firefighters. She advises they implement commonsense changes, such as aerobic exercise and healthy eating. The National Fire Protection Association sets health standards, including regular physical exams. But, Schafer said, these are only recommendations. "Change in policy takes time," Feairheller said. "Whatever I can do to raise awareness, I plan to do." Feairheller has already affected someone else: her 18-year-old daughter. Kacey Feairheller, an EMT, goes on runs with East Brandywine. Kacey will join the Marine Corps, with dreams of becoming a trauma nurse. "I'm proud of all my kids," Deborah Feairheller said. And Kacey is "a little mini-version of me."